One of specific features of life in “DPR” is the fact that it is not possible to buy a lot of habitual food and commodities any more. 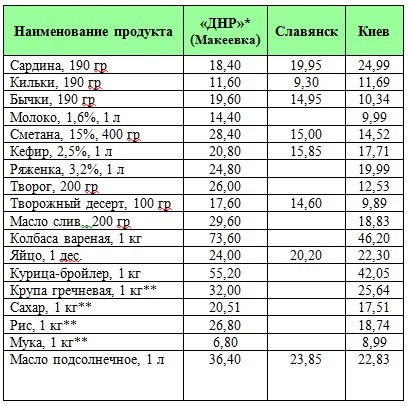 Pricing policies in the “republic” are inexplicable and prices themselves have risen far beyond living wage (which has not been estimated by “DPR” yet). The living wage in Ukraine was raised by 13.3% in September and as the inflation peak is over it is highly possible that the prices will be finally fixed on some level. Traditionally the highest living wage is observed in the capital, but even Kyiv prices cannot compete with Makiivka supermarkets. Our correspondents compared prices in several supermarkets, but the only thing which is cheaper on occupied territory is canned fish. 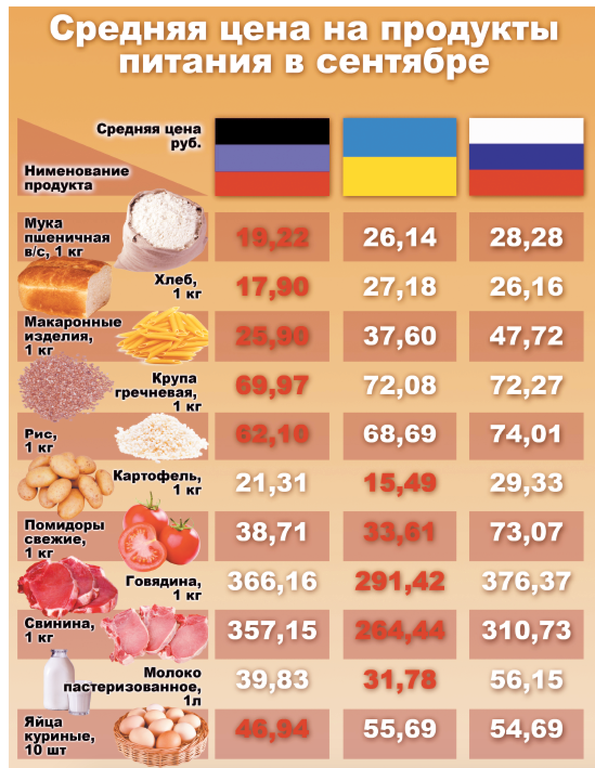 In Slovyansk and Artemovsk prices in supermarkets are a bit higher than in small retail shops and at markets and the range of goods is more limited. Shop assistants explain that a lot of peole from Donetsk and Horlivka, who visit the town, buy all the popular commodities. In Mariupol, where more popular national supermarket chains operate, the prices are about 1 or 1.5 times higher than on occupied territory. Anna, who has lived on the occupied territory for a year and a half, says, that it is useless to go shopping if you have less than one thousand rubles in your wallet. The quality of food also leaves much to be desired. The Russia sends to “L/DPR” all its poor quality goods. Even cats refuse to eat Russian sausage or Russian “cat food”. Before occupation, Donetsk residents had not known that dairy products can contain so little milk and so much palm oil, the price is nearly on the same level with Ukrainian dairy products (sold on liberated territory) and made of natural milk. Situation with meat and poultry is the same. On Ukrainian territory it is cheaper and buyers can be sure of its quality. There are no mechanisms which would allow to control quality of food in “DPR”. The situation can change only if the occupied territory returns under Ukrainian jurisdiction. Then money will return back to wallets, quality and selection — to supermarkets and prospects for the future to the lives of Donetsk residents.